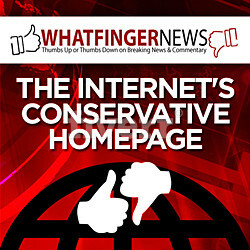 Oh, and the unintended consequences of trying to regulate a monster. 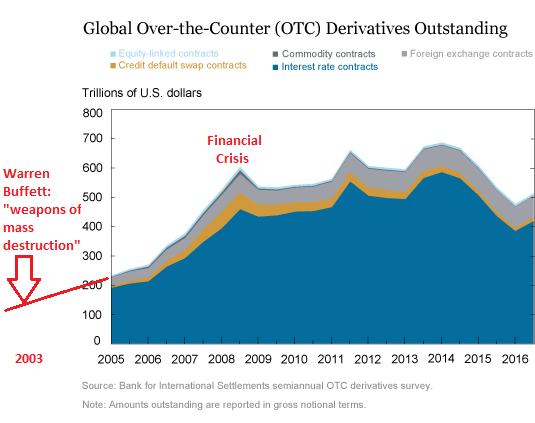 Though the notional amount [of derivatives] outstanding has declined in recent years, at more than $500 trillion outstanding, OTC derivatives remain an important asset class. An important asset class. A hilarious understatement. Let’s see… the “notional amount” of $500 trillion is 25 times the GDP of the US and about 7 times global GDP. Derivatives are not just an “important asset class,” like bonds; they’re the largest “financial weapons of mass destruction,” as Warren Buffett called them in 2003. The 2007-09 financial crisis highlighted weaknesses in the over-the-counter (OTC) derivatives markets and the increased risk of contagion due to the interconnectedness of market participants in these markets. The vast majority of the derivatives are interest rate and credit contracts (dark blue). Banks specialize in that. For example, according to the OCC’s Q4 2016 Report on Derivatives, JPMorgan Chase holds $47.5 trillion of derivatives at notional value and Citibank $43.9 trillion. The top 25 US banks hold $164.7 trillion, or 8.5 times US GDP. So even a minor squiggle could trigger some serious heartburn. I view derivatives as time bombs, both for the parties that deal in them and the economic system. Basically these instruments call for money to change hands at some future date, with the amount to be determined by one or more reference items, such as interest rates, stock prices, or currency values. In my view, derivatives are financial weapons of mass destruction, carrying dangers that, while now latent, are potentially lethal. [W]hile the new trading, clearing, capital, and margin requirements have not generated the expected levels of derivatives market standardization, these requirements may be driving new market behaviors. For example, higher margin requirements for bilateral contracts may incentivize different types of institutions to become CCP [Central Counterparty] members, while higher capital requirements may lead to fewer traditional intermediaries providing clearing services. [S]ome CCPs are evaluating the possibility of allowing direct access for buy-side firms to mitigate the impact of capital regulation on the market. [R]egulations have disparate impact on different types of financial institutions. For example, mandatory clearing and higher margin requirements for non-cleared derivatives are having unintended consequences for end users of derivatives. In particular, institutions that use derivatives to hedge unexpected changes to their liabilities engage in bilateral contracts to match their exposures; the higher margin requirements for non-cleared trades thus increase their hedging costs and may reduce their willingness to hedge. The report concludes with this zinger: “Possible further innovations to market practice and regulatory landscapes warrant consideration, given that OTC derivatives remain a significant part of the financial landscape.” Again, this hilarious understatement concerning the $500 trillion monster.